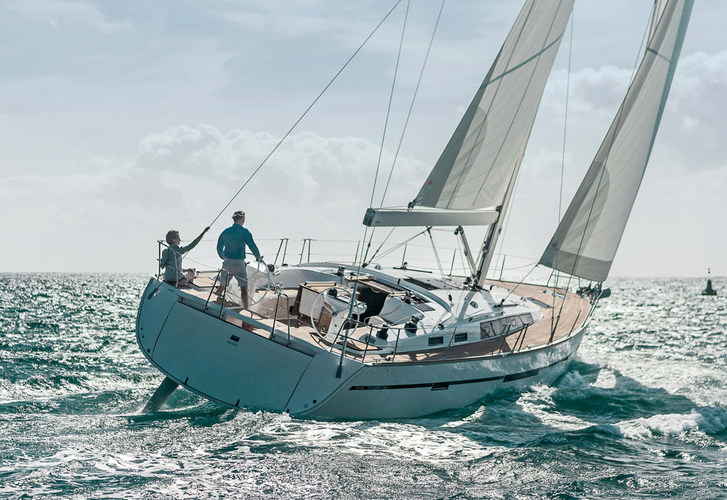 Breathless is a name of boat Bavaria Cruiser 56 ,which was produced in 2016. You can charter her from port Lefkada around Ionian Sea. Breathless is equipped with 12 beds. Beds on the boat are configured in 12 layout. 6 bedrooms are situated inside the sailboat Breathless . Check more boats in section: Yacht charter Ionian Sea. Guests can feel comfy on this boat , because there are 3 WC for their disposal. With 280.00 l liters in tank for fuel you can sail really far and still be independent because of 689.00 l liters in water tank. Breathless is supplied with engine 100 hp Yanmar. Vessel's dimensions are: lenght - 16.45 m , beam - 4.76 m and 2.46 m of depth. On the yacht you can make use of following equipment: Air conditioning, Radio / cd player, Bimini top, Dinghy, Anchor electric windlass, Bow thruster, Gps plotter, Gps, Solar panels, generator. . Caution has value 3500.00 EUR. In our search machine you can effortlessly check avalailability of vessel Breathless from Lefkada over here: Yacht charter Greece.